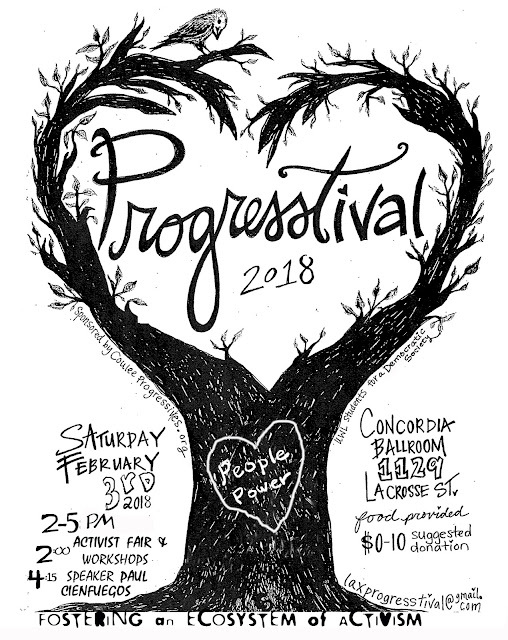 Coulee Progressives: Updates on February events! Hope you can join us for the 2018 Progresstival, 2 to 5 p.m. on Saturday, February 3. We are excited to welcome and welcome back many local organizations working on issues of social justice, sustainability, voting rights, human rights, and more. This year, for the first time, we will also have short workshops on organizing and the importance of people power in our area. There will also be appetizers and beverages. Our keynote speaker, Paul Cienfuegos, is a national organizer and trainer in the community rights movement. Community rights and the related rights of nature movement reject the corporaate system we currently live in and encourage activists to make laws and systems work for the people and natural systems that sustain us all. Following the event at the Concordia, those interested are encourged to continue the conversation over pub food and drinks at the Brickhouse with our speaker, event organizers, and others. We still have a couple of half-table spaces available so if your groups would like to display, sign up, and network, please email. We are also looking for a space for Mr. Cienfuegos to stay while he's in town (possibly Friday evening and/or Sunday evening). If you can offer a space (cat free) for him, please email. The event is open to all. Donations at the door will help pay for event costs. The Progresstival will get your active new year off to a great start. Connect and network with the many groups working on important issues and sign up to help make good changes happen! Look for a flyer soon. But in the meantime, please share this info! Did you know that it's illegal for a city, town, or county government to pass laws that protect the health and welfare of a community from destructive corporate activities? No wonder it's so difficult to stop corporate mines, pipelines, and factory farms, even when an entire community opposes such activities. There are fascinating historical reasons why communities are not allowed to pass such laws, but these reasons make no sense as they violate We the People's right of self-government that our ancestors fought and died for in the American Revolution. Paul Cienfuegos' introductory workshop will share some of this history, introduce the Community Rights movement, and outline how We the People can breathe new live into civic engagement by reclaiming the structures of law that have made real democracy impossible until now. Since 1999, 200 communities in nine states have passed legally groundbreaking locally-enforceable Community Rights laws which have banned fracking and oil drilling, water withdrawal for bottling, toxic sludge dumping on farmland, corporate-managed infrastructure, unsustainable energy development, and more. 95% of these laws have never been challenged in court. “We the People” must exercise our RIGHT to pass laws that protect our community's health and welfare. Let's get organized! No previous experience or knowledge is necessary to attend this three hour introductory workshop. Celebrate an active new year!